A few months ago, I asked whether American Dad could, given its anything-for-a-laugh model, create something with an emotional core. It didn’t entirely work then, but this time, with “Stan’s Best Friend,” the show manages to find a mechanism that does work. Its focus is on euthanasia, for a pet in the episode, but most of the arguments could just as easily be made about humans—in fact, the show shies away from making pet-explicit arguments. The Smith family gets a puppy who gets critically injured, just after Stan falls in love with it. But Stan had a traumatic past experience where he had to put down his beloved dog for no good reason, so he’s not ready to have that happen again, even though the dog clearly has no reason to be kept alive. “Stan’s Best Friend” works a lot better than “The Unbrave One” at reaching that emotional core because it goes all out. The emotion and the jokes take their turns, instead of being done at the same time. 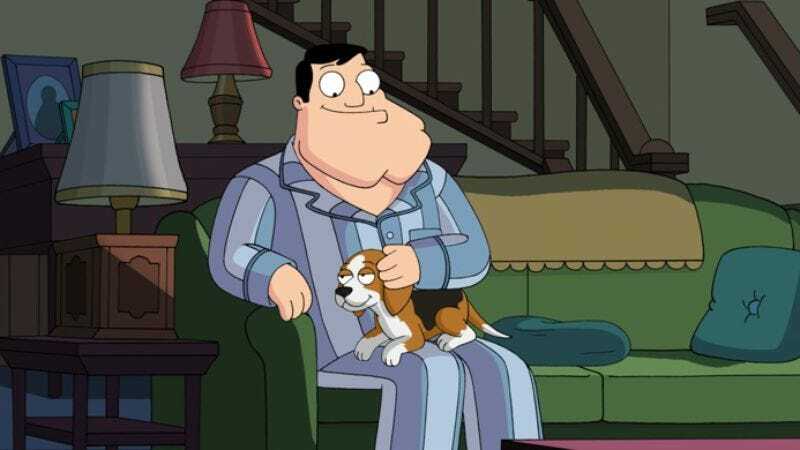 Of course, the show’s aware of this—Stan tells the tragic story of his first pet, and finishes by saying that it’s so sad he can’t even undercut it with a joke. This veering between comedy and pathos is a solid for dealing with an irony-soaked culture, which is a set of people that probably includes most A.V. Club readers and most American Dad viewers. The emotion is strong enough to build the tension, and the humor breaks the tension enough that viewers don't have to in such a way that they lose their connection to what’s going on. This is excellent when it works, and is part of the reason I enjoy Joss Whedon shows or Misfits. Those are tonally different from “Stan’s Best Friend”—they’re dramas with strong comic impulses, where AD is a comedy that has some dramatic power in this episode—but there’s similar structure here. “Stan’s Best Friend” comes down pretty hard on the side of euthanasia, with the episode taking the form of Stan coming to terms with his first dog Freddy’s death. As a polemic, it’s a little bit too straightforward to really be effective. There’s never really any doubt that Kisses either should be allowed to die, or that he’s going to die. So it becomes more a matter of Stan’s emotional journey than a Very Special Episode. And using the lens of the character instead of the issue makes it much more palatable. There’s also a B-story, as Haley and Jeff confront their own mortality after Kisses’ accident. Their drawing of a will leads to the revelation that Jeff owns the rights to Blues Traveler’s first album, but he’s given it away. It doesn’t resolve in terribly exciting fashion, but it does give Jeff and Haley a story of their own that’s both interesting and amusing. It isn’t saying much to suggest that it’s the best storyline they’ve had as a couple since they got married, but it’s till worth saying. Something can be done with these characters. “I think the dude who lives in your parents’ attic has a crush on me. Makes me uncomfortable.” I think we need more Jeff and Roger.